Adresses an issues, which cause ZugInfo to incorrectly display all connection when queried from the favorite tab, while only local connections had been selected in the Favorite (only happened after first startup). On a completely different note: I had quite a nice chat with the people from DB. Maybe I can convince them to include a save connection feature into DB Navigator (and ticket purchase, which would be the killer feature for me). [Update:] The update has been submitted to Apple (Dec 23). Happy holidays to all of you! yep, increasing the prices goes hand in hand with changing the mobile website. Today the DB decided to again change their webinterface (which is browsed by ZugInfo). This means for the moment ZugInfo is broken and we are working on a fix. Sorry for the inconvenience. [Update:] Alrighty then! Bugfix version finished, just needs some polishing (i.e. testing). Hope to submit it tomorrow. If I find the time over Christmas, I will try to implement a more sustainable solution for the website change problem. [Updated:] Just submitted the bugfix to Apple (ZugInfo 2.1.2, Dec 13, 10pm). Keep you posted. [Update:] Thanks to the swift work of the guys and girls of the Apple App review team ZugInfo 2.1.2 is now available in the App Store (Dec 18). Today Deutsche Bahn (German Railways) announced that they will publish their own IPhone appliciation. The detail – including the release date – are still vague, but if it is any good, I might stop developing ZugInfo. I keep you guys posted. And let me know what you think. 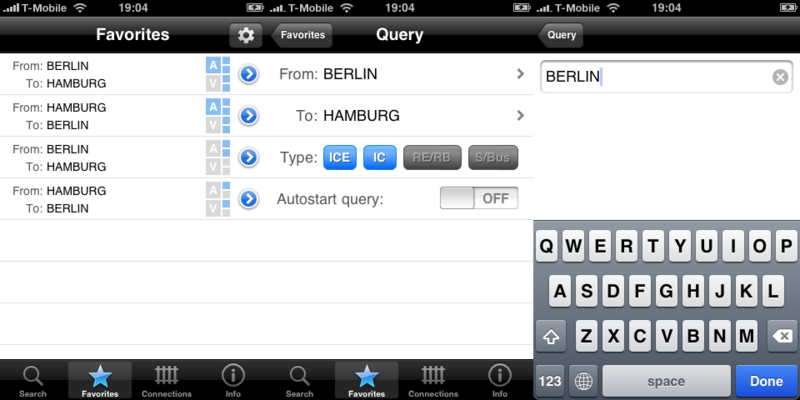 [Update:] There we go, DB Navigator is available in the App Store (Dec 15). Let’s have a look. Today the DB website changed and caused some problems with the ZugInfo display of the connection type (thx to Markus for pointing that out). I am working on an update…..
[Update:] I got a working version of a quick fix on my laptop. A few more test and I will submit it to the App Store. [Update:] A quick fix version has been submitted to the App Store. If anyone knows how to speed up the Apple review process, please contact me. Thank you for your patience. [Update:] Thanks to the Apple review team the update is now available at the App Store (Oct. 3rd). So there it is: the all new edit favorites function. At least the basics. I can imagine to do much more with this in the future. But for 2.1 this should be fine. Beta testing is on the way and I expect to submit by the end of the week. I still have to implement the editing of the saved queries, which turns out to be quite a pain So stay with me. PS: I will have another look at the location to location search (instead of station to station), an option which is also offered by DB. The day will finally arrive: copy, cut, & paste on the IPhone. No kidding. Ah yes, and IPhone OS 3.0. Almost forgot about it. Unfortunately, ZugInfo was not yet IPhone OS 3.0 ready. Today I submitted a compatible version (2.0.2). But the people in the App Store review department seemed to be quite busy theses days. I am still waiting for the approval for a RegenRadar update I submitted 10 days ago. Well, let’s hope for the best and keep the fingers crossed that the update will arrive in time. I just submitted ZugInfo 2.0 for review to the App Store. Workers day, hurray!